And then accidentally setting himself on fire? That's a fairly accurate representation of my relationship with fire: glee followed quickly by injury or burnt hair. And yet I never learned my lesson. I love fire. Not in a, hey let's burn down this random building way (I'm not a psychopath) but I will take any legitimate opportunity to burn anything. Which I suppose is why my family's yearly Christmas bonfire fills me with giddy excitement. Every year, my aunts and uncles and cousins gather at the family property a few days after Christmas and light fire to a huge pile of cleared brush and detritus. 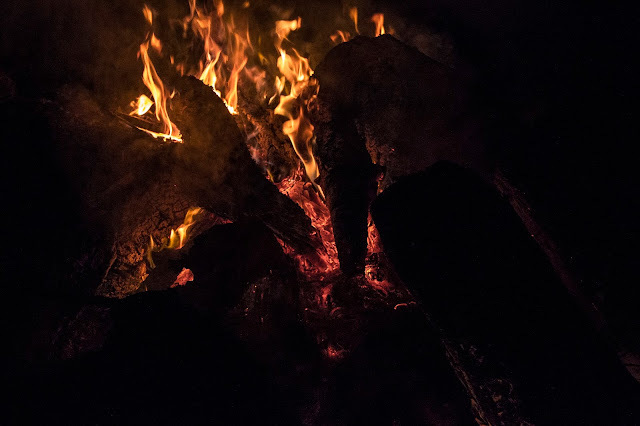 Under the cover of darkness, by the light of the fire, my mother and her siblings rehash the stories of their shared childhood and we cousins search for the best s'more-making sticks. Slowly the fire builds and dies while we inch ever closer until the embers burn too dull to heat the air. Then, slowly, we rise and wander back to the house and then to our cars and retreat into the night.